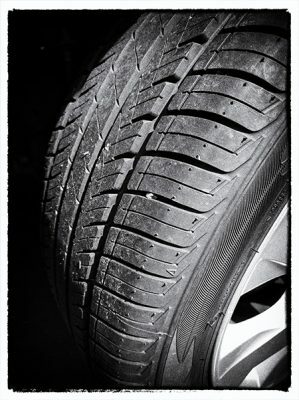 Tyres are important, in fact tyres are the only items on your car that are always being used. When you car is turned off it’s sitting on its tyres and every time you drive your tyres are in constant use on the road. Tyres are one of the most important safety items on your car, if they are worn, under or over inflated or even the wrong design for your car than you are much more likely to have a tyre related accident. So what about recycled tyres, should you use them and what do you need to look out for, what are the advantages? You save money when you buy recycled used tyres, most recycled tyres are at least half the price of the same new brand tyre, that’s a huge saving! Some used tyres come off near new accident damaged cars so they have hardly any wear at all, they are nearly as good as new, and did we mention you save money as well? Using recycled tyres is also a green thing to do as the tyre factory does not have to manufacture a new tyre when you fit a used one to your car! Did you realise that brand new tyres are used tyres as soon as you fit them to your car, they are only brand new until you use them the first time so why would you want to spend all that money on new tyres that are used as soon as you use them? A good used high quality tyre will always be better, safer and nicer to drive on than a cheap brand new tyre, let’s be honest, wouldn’t you rather drive on high quality recycled used Michelin tyres than new Chinese made Sunpow tyres? At Strong Group we specialise in high quality recycled tyres, every tyre we sell has been visually checked and inspected for wear and tear, we can supply singles as well as matched pairs and sometimes entire sets to suit your vehicle. Because we process hundreds of vehicles every year we have most sizes from 13 to 20-inch in stock, just ask! We also have a fitting and balancing service available when you buy your recycled tyres from us so there’s no need to go anyplace else. So next time you need tyres for your car have a good think about recycled tyres because those new tyres you might buy will only be new once!